نوری, سیدمحمد, دهقانیان, چنگیز. (1396). بررسی رفتار تریبولوژیکی فولاد ساده کربنی CK45 نیتروکربوره شده به روش پلاسمای الکترولیتی. نشریه علوم و مهندسی سطح, 13(34), 93-100. سیدمحمد نوری; چنگیز دهقانیان. "بررسی رفتار تریبولوژیکی فولاد ساده کربنی CK45 نیتروکربوره شده به روش پلاسمای الکترولیتی". نشریه علوم و مهندسی سطح, 13, 34, 1396, 93-100. نوری, سیدمحمد, دهقانیان, چنگیز. (1396). 'بررسی رفتار تریبولوژیکی فولاد ساده کربنی CK45 نیتروکربوره شده به روش پلاسمای الکترولیتی', نشریه علوم و مهندسی سطح, 13(34), pp. 93-100. نوری, سیدمحمد, دهقانیان, چنگیز. بررسی رفتار تریبولوژیکی فولاد ساده کربنی CK45 نیتروکربوره شده به روش پلاسمای الکترولیتی. 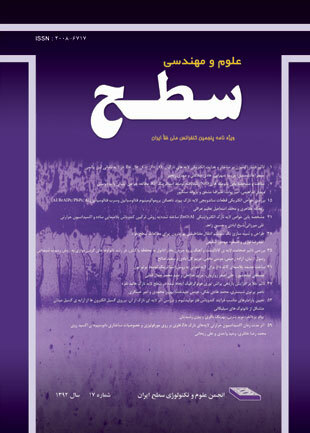 نشریه علوم و مهندسی سطح, 1396; 13(34): 93-100. فولادهای ساده کربنی بعنوان یکی از پرکاربردترین مواد مهندسی، باوجود ویژگی‌های مطلوبی مانند استحکام و چقرمگی بالا، قابلیت ماشین‌کاری و هزینه‌های کاربردی پایین، نقاط ضعفی همچون مقاومت سایشی نسبتاً پایینی دارند. در بین روشهای مختلفی که برای پوشش‌دهی سطح فلزات بکار می‌روند، فرایند نیتروکربوراسیون به دلیل دمای پایین، زمان کوتاه و نیز پایداری ابعادی قطعه مورد توجه قرار گرفته است. در این پژوهش فرایند نیتروکربوراسیون به روش پلاسمای الکترولیتی در الکترولیت حاوی اوره و کربنات سدیم در ولتاژ 380 ولت و در زمانهای 5، 10 و 20 دقیقه انجام گرفت. به منظور بررسی اثر زمان پوشش‌دهی روی خواص لایه تولیدی از آنالیز پراش پرتوایکس (XRD)، میکروسکوپ الکترونی روبشی (SEM) استفاده شد. در ادامه نیز سختی سطحی و نیز رفتار سایشی این پوششها با آزمون توپ روی دیسک (Ball on disc) بررسی گردید. نتایج نشان داد که اعمال پوشش نیتروکربوره سبب بهبود رفتار تریبولوژی نسبت به نمونه بدون پوشش گردید. همچنین نمونه پوشش داده شده در زمان 20 دقیقه، با ضخامت µm 20، سختی 896 ویکرز و میانیگین قطر حفرات µm 55/4، بهترین رفتار تریبولوژیکی (یعنی کمترین ضریب اصطکاک: 32/0 و نیز کمترین کاهش وزن) را از خود نشان داد که در مقایسه با نمونه‌های تهیه شده در زمان­های 5 و 10 دقیقه، مقدار زبری سطحی را تا 47/0 (حدود 2 برابر) افزایش داد، درحالی­که کاهش وزن این پوشش پس از صد متر سایش در مقایسه با دیگر نمونه‌ها، تنها حدود 14% درصد کاهش یافت. 1. M. Roy, Surface engineering for enhanced performance against wear, Heidelberg, Germany: Springer, (2013). 2. F. Borgioli, E. Galvanetto, & T. Bacci, Low temperature nitriding of AISI 300 and 200 series austenitic stainless steels, Vacuum, 127(2016) 51-60. 3. A. Vázquez, A. L. Ramírez, & J. A. Juárez, Microstructural Evaluation of Salt Nitrocarburizing H13 Steel as a Function of Time, In Journal of Physics: Conference Series, 792(2017). 4. E. J. Mittemeijer. Fundamentals of nitriding and nitrocarburizing, ASM handbook. ASM International, (2013) 619-646. 5. ASM International. Handbook Committee. ASM handbook: Steel Heat Treating Fundamentals and Processes. Press Quenching, 4 (2013) 252-256. 6. P. E. Nasi, L. V. Elektrolitu, S. Se, and N. I. A. Nitratom, Plasma elctrolytic saturation of 316L stainless steel in an aqueous electrolyte contaning urea and amminium nitrate, Materiali in Tehnologije, 47(2013) 307-310. 7. Y. Jiang, Y. Bao, and K. Yang, Formation and friction behavior of plasma electrolytically nitrocarburized surface layers on Q235 steel, Surface and Coatings Technology, 269(2015) 324-328. 8. P. N. Belkin, A. Yerokhin, and S. A. Kusmanov. Plasma electrolytic saturation of steels with nitrogen and carbon, Surface and Coatings Technology 307,(2016)1194-1218. 9. A. L. Yerokhin, X. Nie, A. Leyland, A. Matthews, and S. J. Dowey, Plasmaelectrolysis for surface engineering, Surface and Coatings Technology, 122, (1999) 73-93. 10. X.-Z. Hua, L. Zhou, X. Cui, A.-H. Zou, W.-B. Xu, and X.-L. Zhou, The Effect ofAmmonia Water on the Microstructure and Performance of Plasma Electrolytic Saturation Nitriding Layer of 38CrMoAl Steel, Physics Procedia, 50, (2013)304-314. 11. H. Tavakoli, S. M. Khoie, S. Marashi, and O. Bolhasani, Effect of Electrolyte Composition on Characteristics of Plasma Electrolysis Nitrocarburizing, Journal of Materials Engineering and Performance, 22(2013) 2351-2358. 12. S. A. Kusmanov, I. G. Dyakov, Y. V. Kusmanova, & P. N. Belkin, Surface modification of low-carbon steels by plasma electrolytic nitrocarburising, Plasma Chemistry and Plasma Processing, 36(5)(2016)1271-1286. 13. J. Alphonsa, V. Raja, and S. Mukherjee, Study of plasma nitriding and nitrocarburizing for higher corrosion resistance and hardness of 2205 duplex stainless steel, Corrosion Science, 100(2015) 121-132. 14. N. A. Popova, L. G. Zhurerova, E. L. Nikonenko, & M. K. Skakov. Effect of plasma electrolytic nitrocarburizing on phase composition of 0.3 C-1Mn-1Si-Fe steel, Inorganic Materials: Applied Research, 8, (2017) 130-135. 15. M. Aliofkhazraei, P. Taheri, A. S. Rouhaghdam, and C. Dehghanian, Systematic study of nanocrystalline plasma electrolytic nitrocarburising of 316L austenitic stainless steel for corrosion protection, Journal of Material Science and Teknology-Shenyang, Vol. 23(2007) 665-669. 16. M. Aliofkhazraei, S. Ahangarani, and A. S. Rouhaghdam, Study of pulse on pulsed nanocrystalline plasma electrolytic carbonitriding on the nanostructure of compound layer, Surface Review and Letters, 15(2008)427-434.